Countries across the Indian Ocean have been marking the fifth anniversary of the catastrophic tsunami that killed almost 250,000 people. In Indonesia's Aceh province, where 170,000 died, thousands held prayers in public mosques and private homes. On Thai beaches, Buddhist monks chanted prayers as mourners held pictures of loved ones lost five years ago. Hundreds of tourists also returned to Phuket island to mark one of the worst natural disasters of modern times. A moment of silence was observed on Phuket's popular Patong Beach marking the time the tsunami struck. German survivor Adolf Ruschitschka, 73, and his wife Katherina waded into the turquoise seawater to lay white roses as a tribute to the dead. "We [still] come and stay here because we are alive," Mr Ruschitschka told Reuters news agency. Mourners on Phuket later lit candles and released lanterns into the sky. Other ceremonies are being held in the 14 countries hit by the massive wave, triggered by a massive undersea earthquake off Indonesian island of Sumatra. Thousands of survivors in Indonesia's Aceh province, the hardest-hit area, gathered at mosques and beside the mass graves where tens of thousands were buried. "We came here to pray for our lost ones," Jallaludin, who lost his mother, brother and sister in the tsunami, told the BBC. Banda Aceh's main business district, which was completely destroyed by the tsunami, is again bustling with activity, says the BBC's Karishma Vaswani there. Our correspondent says many have rebuilt their lives thanks to billions of dollars in international aid. But five years on, the grief and trauma of the disaster are still very real for the people of Aceh, she adds. After Indonesia, Sri Lanka was the country worst hit by the tsunami. More than 40,000 people died there and some 500,000 were displaced. On Saturday, people prayed beside mass graves and also held two minutes of silence to mark the exact time the deadly waves struck the island. Visitors can still see blackened, destroyed buildings in the country's south and west, the BBC's Charles Haviland reports from Colombo. But he adds there has been good recovery too - aid grants have brought some farmers to a higher technical level than before. And one model village built by a philanthropist - which started out as 1,000 homes for victims - has now developed to take in a health centre, diving classes and more. 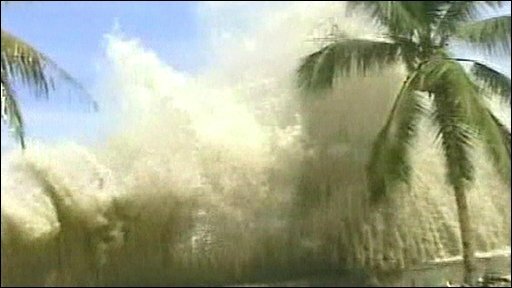 The tsunami was sparked by a 9.2-magnitude earthquake off Sumatra - the mightiest earthquake in 40 years. In Aceh province, the quake toppled homes and buildings and sent panicked residents rushing into the streets. About 20 minutes later, a wall of water up to six stories high surged in from the sea, burying thousands in thick black mud and leaving others to scramble up buildings or cling onto trees. It was a disaster on an unprecedented scale, the BBC's Rachel Harvey reports from Bangkok. Apart from the deaths, hundreds of thousands people lost their homes and livelihoods. No single agency or government could have been prepared for the challenges the tsunami presented, our South-East Asia correspondent says. Following the disaster, the UN has been designated to co-ordinate relief work in massive disaster zones. The so-called Cluster System for emergency response was used to good effect after the Padang earthquake in Indonesia in September, our correspondent says.